Two news items this week! First of all, a great Columbus jazz musician is in need of help. Drummer Matt Wagner, who has played beautifully with a host of greats over the years, has had serious health issues over the past several years that have left him unable to work and in dire financial straits. Friends have setup a site for donations – please click here and consider supporting Wagner and his wife Trish. Secondly, congratulations are in order – Bobby Floyd has been nominated for a Grammy! Floyd has been invited to the 2019 Grammy Awards ceremony, as a featured artist on All About That Basie by the Count Basie Orchestra. This recording has been nominated as Best Large Jazz Ensemble Album. Congrats Bobby! Beyond his standing Sunday Showcase at Notes, you can also see him Monday, January 21st, 11:30am – 1:30pm at the annual MLK Day of Learning: Hank Marr Luncheon at Capital University. Floyd will be joined by Byron Stripling, Michael Cox, and Bob Breithaupt, so this will be an excellent way to celebrate the day (details here). Keep reading for previews, like the return of Gene Bertoncini and half of Huntertones! Friday, January 18th (8 – 11pm): Mirth Stellar Regions Trio and Stan Smith Trio at Filament at The Vanderelli Room, Franklinton. After a stellar first year of operation, Filament is surging into 2019 with more great shows. This doubleheader is of special note for jazz guitar fans. Opening is acclaimed guitarist Smith and his trio, with Steve Perakis on bass, and Breeze Smith, Stan’s brother visiting from Los Angeles, on drums. After this simpatico display of fusion, up next will be Northeast Ohio’s Mirth Stellar Regions Trio, with Tim Mirth on guitar, Seth Boyle on bass, and Tony Kazel on drums. This improvisational outfit is influenced by artists such as Kurt Rosenwinkel, Chris Potter, Mark Giuliani, Wayne Krantz, James Brown, and Shawn Lane, and apparently tunes by both Coltrane and Hendrix are on their setlist. More details here – the event is BYOB and a $5 to $10 donation is suggested for admission. Sunday, January 20th (8 – 10pm): Gene Bertoncini Quartet at Natalie’s. 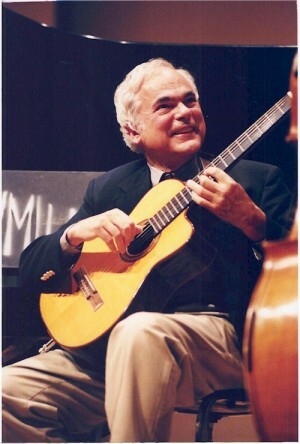 Central Ohio will be graced by legendary guitarist Bertoncini for two shows this weekend. Bertoncini’s resume is long and astounding, including playing with greats like Benny Goodman, Wayne Shorter, Hubert Laws, Paul Desmond, Tony Bennett, Lena Horne, and our own Nancy Wilson, plus in the staff orchestras on shows including The Tonight Show Starring Johnny Carson. After a Jazz Guitar Night with master guitarist Tom Carroll and acclaimed bassist Doug Richeson at Three Tigers Brewing Company in Granville on Saturday at 9pm – FREE SHOW, more details here – Bertoncini comes to Natalie’s on Sunday with a surefire quartet featuring Cincinnati piano great Phil DeGreg, plus Richeson on bass and the inestimable Jim Rupp on drums. Make plans for a night of sublime straight-ahead guitar! Tickets and more info for the Natalie’s show are available here. Thursday, January 24th (9 – 11pm): Raft Captain at Natalie’s. Another great show at Natalie’s this week is a new venture from bandmates in NYC’s Huntertones, returning to their roots in Columbus with new material. Raft Captain is made up of Adam DeAscentis on Bass, John Hubbell on drums and Dan White on saxophone. The trio will be presenting new originals as well as “salutes to such modern leaders in music as Sheryl Crow, The Police and Thundercat.” Tickets and more info are available here. The band will also play the Jazz Dinner Club Series at The Refectory on Friday, January 25th at 6pm – more details here (space limited).